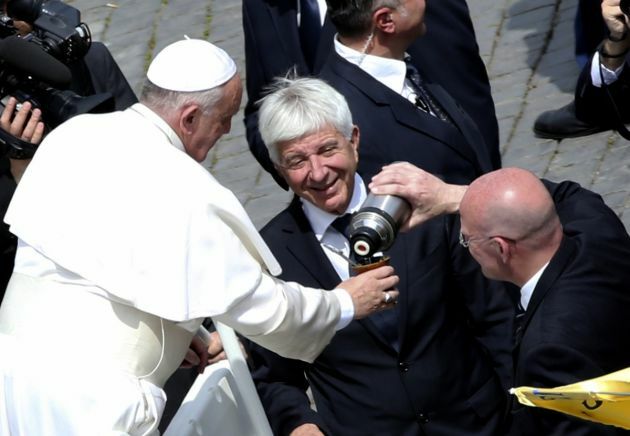 (Photo: REUTERS / Alessandro Bianchi)Pope Francis drinks mate, an Argentinian drink, during the Palm Sunday mass at Saint Peter's Square at the Vatican April 13, 2014. Pope Francis has pleaded for the young to honor the elderly in the throw-away culture that pervades the world. The 78-year-old pontiff addressed members of the Pontifical Academy for Life on March 5 during a meeting in Rome. Francis called on Western societies to have a renewed appreciation for their senior citizens, declaring that "where there is no honor for the elderly, there is no future for the young." The Pope associated the duty of honoring the elderly with the biblical commandment to honor one's parents. On the contrary, he said, the Bible has a stern warning for those who neglect or mistreat their parents. Such judgement applies today when parents, "having become older and less useful, are marginalized to the point of abandonment." The Pope explained that "to honor" can be understood in our day "as the duty to have extreme respect and to take care of those who, because of their physical or social condition, could be left to die, or 'made to die'." Francis said that palliative care recognizes, at the end of life, the value of the person. He called on all those involved in palliative care to preserve this spirit of service. He urged carers to remember that "all medical knowledge is truly science, in its most noble sense" only if it has in view the true good of the human being, and it can never be achieved when it acts contrary to human life and dignity. "It is this capacity for service to the life and dignity of the sick, even when they are old, that is the measure of the true progress of medicine, and of all society." "Thanks to advancements in medicine," the 78-year old pontiff said, "life has been lengthened, but society has not become more open to life." He said current societies lead the young "to ignore old age as if it were a disease to keep at bay," he said. At the same time the Pope said, "When we become older, especially if we are poor, sick or alone, we experience the shortcomings of a society organized around efficiency, which ignores the elderly." The elderly are, however, an asset that society cannot ignore. "The Church,"said Pope Francis, "cannot and does not want to conform to a mentality of impatience, much less to to indifference or lack of appreciation in relation to old age. "We must reawaken the collective sense of gratitude, appreciating, hospitality, which makes the elderly feel like a living part of his community."